A house in the Hebrides has an infestation of mice, but they seem rather grateful according to The Sunday Post and other papers. Around 200 vintage copies of Mickey Mouse Weekly have been found at the home of renowned Gaelic scholar Dr John Lorne Campbell on the island of Canna. The collection of photogravure comics, which kept their glossy format through the years of wartime rationing, is reckoned to be worth around £40,000. Argyll-born Campbell is best known for his love of Gaelic and Scots folklore, for writing about life in the Hebridies, and for giving Canna to the National Trust in 1981. He died in 1996, aged 90. “He assiduously collected every copy of the Mickey Mouse Weekly from 1937 until the 1950s and was such a fan of the Disney characters that he even ironed the comics so that they could be kept in pristine condition. “Over 200 comics have been found, including copies from wartime, which shows the difficulties John Lorne Campbell was willing to overcome in order to keep up with Mickey and friends’ adventures. “He was well known for his academic prowess and his determination in purchasing Canna and running it as a traditional Hebridean community. If you are not familiar with the large page format Mickey Mouse Weekly, it was the first full colour photogravure comic published in the UK. Willbank Publications launched the title in February 1936 but it later passed to a pre-Eagle Odhams Press. At its peak, weekly sales averaged 750,000 and featured early work by artists such as Ron Embleton and Frank Belamy. 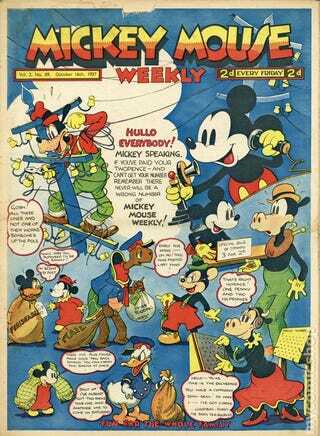 Mickey Mouse Weekly ran for 920 issues until Odhams lost the Disney license in 1957. They moved non-Disney material moved to a new weekly called Zip while new license holder Vernon Holdings launched Walt Disney’s Mickey Mouse which never recaptured the same affection as its predecessor. The comic became Walt Disney Weekly before it folded in 1961. He was a man hailed for helping to preserve the Gaelic language.